To make Thanksgiving stress-free, roast a turkey breast instead of a whole bird. Sans the wings, thighs, and legs, a turkey breast cooks evenly throughout, meaning you won’t dry out the breast meat while waiting for the dark meat to finish. To further ensure juicy meat, brine the breast for a couple of hours before roasting. Brining is an age-old technique used to tenderize, flavor, and reduce cooking time of foods. A brine, at its most basic, is simply a solution of salt and water and is often flavored with sugar, spices, and juices. This recipe adds rosemary, bay, garlic, and orange juice concentrate to impart natural sweetness and citrus flavor. 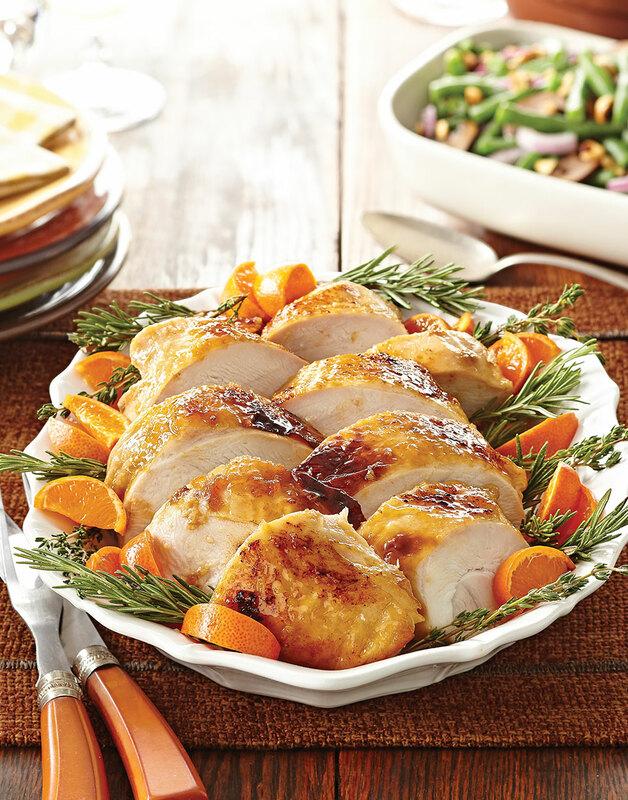 To highlight the citrus, brush the skin of the breast with an apricot glaze while it roasts. For the best results, after removing the breast from the brine, rinse and pat it dry to wash away any excess salt, ensuring perfectly seasoned meat. For the brine, heat water, orange juice concentrate, salt, brown sugar, rosemary, peppercorns, bay leaves, and garlic in a pot over medium to a boil. Cover pot and remove from heat; let cool 20 minutes. Stir in ice until melted. Trim and discard excess rib and wing sections from the breast. Submerge breast in brine, cover pot, and refrigerate until ready to roast, at least 2 hours, or up to overnight. For the glaze, combine preserves, orange juice, honey, Dijon, garlic, and rosemary in a saucepan over medium heat. Bring glaze to a boil, then remove from heat and let cool; discard rosemary sprigs. Remove breast from brine, then rinse and pat dry. Preheat oven to 425°. Place a rack inside a roasting pan and coat rack with nonstick spray. Place breast skin side up on rack and pour wine into bottom of pan. Roast breast 30 minutes, rotate pan, reduce temperature to 325°, then brush breast with glaze. Roast breast until a thermometer inserted into the thickest part registers 165°, about 1 ½ hours more, brushing with glaze every 30 minutes until all glaze is used. Transfer breast to a cutting board, tent with foil, and let rest 20 minutes before slicing. Reserve drippings in pan for Roasting Pan Gravy. Orange juice concentrate adds natural sweetness and acidity to aid in tenderizing the breast. Trim the rib section from the breast to ensure the heat penetrates the breast more evenly.